Subject: AHP NEWSGROUP: Schleese Makes an Impact ‘Down Under’! Schleese Makes an Impact ‘Down Under’! On November 10, 2018, Schleese embarked on a new Journey travelling halfway around the world to answer the pleas of many Australians to help them and their horses. Jochen was appearing at the 2018 Equitana Melbourne conference as an educational presenter, and Schleese was there together with Saddlefit 4 Life® to man the booth and teach aspiring equine ergonomists after the show. The team received an overwhelmingly warm welcome at Equitana! Jochen’s talks brought full stands with standing room only. The rush of fans swarmed the booth for more information, selfies and autographs, conversation and more. The booth sold out in no time leaving us holding back inventory to use for the remainder of the trip and courses. 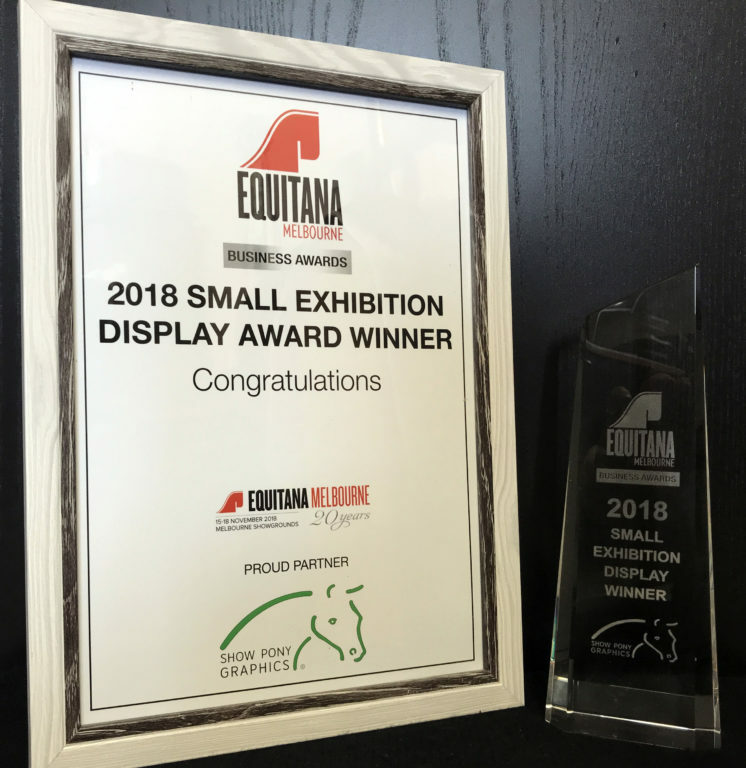 The high point of the show was receiving the “Small exhibition display” award of the year. This award was presented in appreciation of not only the inviting booth set up and high-quality product, but for the team’s professional appearance, the engaging interaction with clients, and the crowd that was drawn to the booth at all times. The Schleese team was always the first there every morning and the last to leave every night. With one day of rest between Equitana and the CEE course, they quickly filled the day with an Australian trainer, who ended up changing over his entire stable to Schleese saddles! The quality of horses presented to us, one after another impressed completely, with top-notch horses coming out of the woodwork. The 20th of November was then the first full course day, with a great group of professionals who are now on their way to becoming Equine Ergonomists. From Australia, Jochen flew to Johannesburg, where he was a panellist and presenter at the Dressage Forum, alongside such notables as Stephen Clarke and Hilary Clayton. While in South Africa, he spent time certifying the next group of Saddle Ergonomists as well as doing two one-day courses in Johannesburg and Durban area. On from there to the Saddle Research Trust in Nottingham, UK, where Schleese was a sponsor of such presenters as Dr. Sue Dyson and biomechanics expert Russell Guire. All in all a round-the-world whirlwind trip that proved very worthwhile! I have had Coco my Dutch Warmblood for 6 years and found it very difficult to fit a saddle for his very large shoulder, long wither and extremely short back. After years of searching buy and trying, with no luck, I finally made an appointment with Natalie Sauner from Schleese in our Alberta area. Coco and I are elated to finally have found the saddle for us! Our custom Obrigado has changed everything for both of us! I am now a balanced rider and Coco is a happy [and] who is willing to do his work everyday. Thanks Natalie for your professional knowledgeable services, you truly are an amazing saddle specialist.